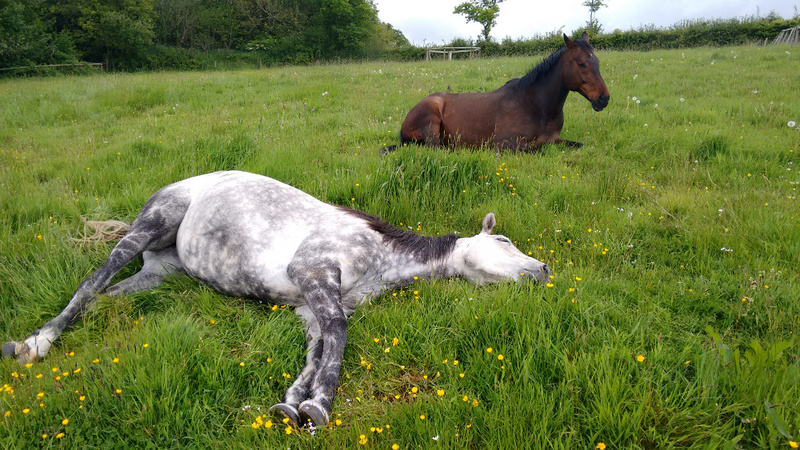 Following on from last weeks diary post, the upshot of all that galloping around after moving to the summer field is to lie down and relax. Charlie and Star have been intensely studying relaxation, and I can report that they do not seem to have moved for several days! I expect to get back to some training next week, hopeful that they will have finished their research into relaxation, which is the best part of the field, and the best position to lie in! I love your authenticity! Relaxing is an important aspect to training. I also remember when I would take a training break and then continue with training my dog would suddenly have huge break throughs! It was definitely true that she was thinking about what she had learned while relaxing. Lol! I am excited to see what happens next! Keep enjoying yourself! Thanks Johanna. Relaxing is definitely part of training. Star was dreaming when I took that – legs moving, nose twitching, one little whinny, and sighs every so often! I’ve seen it lots in dogs, but am not usually around to see it in the horses!